Logo Contest: The Morning After series runs everyday after a Seahawks game, and I’d like to add a logo to represent the series. The logo should incorporate both the name Hawk Blogger and The Morning After. Please send me your submissions at [email protected] before the regular season begins. The winner will get their name and Twitter handle or website attributed on each Morning After article. Beating the San Diego Chargers 31-10 was a reasonable expectation heading into this game. How the Seahawks got there was not entirely encouraging. Pre-season games are difficult to gauge in the NFL since so many players that will not be on NFL rosters are getting significant snaps. Keeping an eye on how the starters play versus the other team’s starters may be more important than any other aspect of the game, including the final score. By that measure, the Seahawks has a disappointing debut. Seattle’s defense came out in a 3-4 look on defense with both Mike Morgan and Malcolm Smith in two-point (standing) stances. This is not something the team did last season, and it showed. The players appeared tentative as Philip Rivers and the Chargers marched down the field 74 yards for an opening field goal. The poor start may be due to the team adjusting to an altered scheme. It may be due to a still-great quarterback playing well, or it may be due to the lengthy list of quality starters that were held out for precautionary reasons. Only additional game time will help identify what the issue is, and whether there is an issue at all. Playing Peyton Manning next week is a great chance to see how much the defense can step up one week to the next. The starting offense was not a lot better. Four plays for 21 yards on the first series. Eight plays for 26 yards on the second series. The line was not getting much push in the running game, and Wilson was not finding receivers in spots he wanted in the passing game. One thing Wilson was able to do during pre-season last year was lead scoring drives with regularity. He only got two chances last night, but those were among his least productive pre-season drives thus far. People can choose to read into that or ignore it. It is the truth, and warrants some attention. Judging the offense without Max Unger, Zach Miller, Sidney Rice, and Marshawn Lynch is difficult. The team will not always have the full compliment of players, and part of Wilson’s growth is showing he can be the catalyst no matter who is surrounding him. Most of the fun began after the starters exited. Charlie Whitehurst is the Chargers back-up, and his return to the sunny beaches of Southern California have done nothing to reduce his suckage on the field. I may be willing to give the Chargers another draft pick just to keep him away from Seattle. 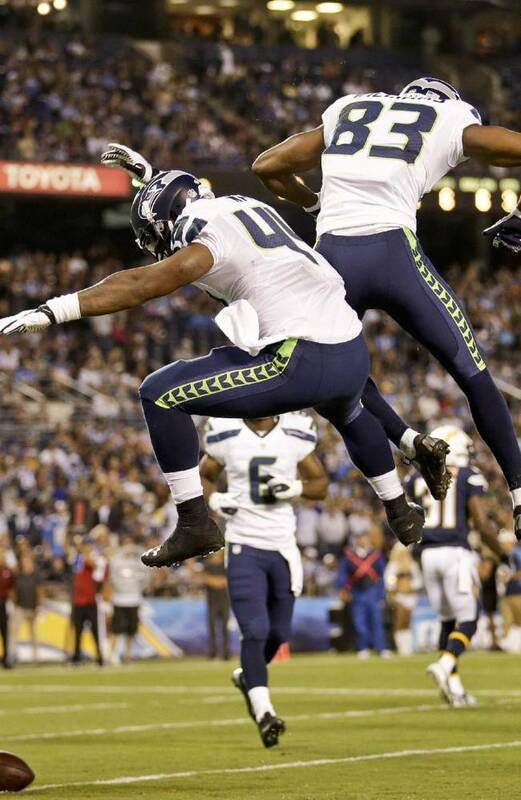 The Seahawks second, third and fourth string players overwhelmed the Chargers. San Diego went 74 yards on 13 plays on their first drive for an average of 5.7 yards per play. They had 164 yards the rest of the game, and averaged only 3.3 yards per play. The offense went for 47 yards on 12 plays for an average of 3.9 yards per play on their first two series, and 292 yards in 43 plays for a whopping 6.8 yards per play average thereafter. When you are more than doubling your opponents yards per play for three quarters of the game, you end up outscoring them 31-7 like the Seahawks did during that time. Enough about the game itself, because really, who cares? Let’s talk about players who made an impression. Pre-season is littered with paper tigers, especially at wide receiver. The things that make Williams so exciting in these situations–size, timing, route running–are things that should carry over into real game situations. The plays he made in this game look a lot like the plays he is making in camp against guys like Jeremy Lane. He is more than just a deep threat, which did not show up yet. Look for him to get more time going against starters in the next few games. He did nothing to change my expectations that he is the fifth receiver on the roster when camp breaks. Man crush…activated. Lotulelei had only four tackles, including one on special teams, but his play was mesmerizing. He plays with an aggression and fearlessness that seems destined to result in game-changing plays. It is not just his hair that is reminiscent of Troy Polamalu. Lotulelei plays linebacker with the same reckless abandon that Polamalu does at safety. I’m not sure we know what his ceiling is yet. As silly as it may sound after just one game, I see a future starting WILL linebacker for the Seahawks. Mayowa terrorized the Chargers lineman all evening. He was credited with 1.5 sacks, and had a handful of pressures. His path onto the roster is not as certain as most would assume as the defensive line is incredibly deep, even without Chris Clemons. The upstart out of Idaho did nothing to hurt his chances, though, and he will find his way onto the team if he can sustain these kinds of results. Bailey was fantastic all night. It is not always easy to follow the lineman on television, so I will need to go back and see how his run-blocking was. His pass-blocking was flawless. Seattle has found a high quality back-up tackle. There is little doubt left about that. He will not take over for Breno Giacomini this year as some are asking about, but he does mitigate the injury risk at tackle, and give the team some options next season when Giacomini is a free agent. Bradford subbed for Bobby Wagner and played a solid game. He did not make impact plays, but he continues to show he is a sure tackler. His strength is defending the run, and he did that well. It was not as clear how he did against the pass. Chances remain strong that he displaces Heath Farwell on the roster. If Maxwell looked like a starting caliber cornerback while intercepting one ball and nearly another, that is because he is. This is a guy who showed a ton of talent when he came into the league the same year as Richard Sherman. The challenges for Maxwell have been durability and playing within the contact rules of the NFL to avoid penalties. He looks as healthy as ever, and would need playing time to get over the penalty issues (remember Sherman and Brandon Browner struggled with that in their first year). The good news is Maxwell is under contract through next season. Jackson made it nearly impossible for Brady Quinn to win the back-up job. His performance was something Quinn does not seem capable of. The quality of Jackson’s deep ball is better than any part of Quinn’s game. He was in command, threw with confidence, and looked like a player that could lead the team to victory should he need to come in. Other players that did well for themselves include: Ty Powell, Malcolm Smith, Derrick Coleman, Christine Michael, Steven Hauschka and Jaye Howard. The team now has a little more than a week to prepare for their next game up in Seattle. Both the offense and the defense will face stiff competition from the Broncos starters. Competition for the back half of the Seattle roster will intensify, and we will start to enter the period where trades could become an option. One would have to assume the front office is going to do what they can to keep players away from teams like San Francisco that could strengthen their rival.